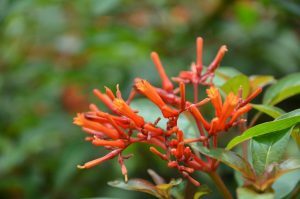 South Florida native Firebush, with its tubular reddish-orange flowers, is an easy-to-grow plant attractive to myriad butterflies and hummingbirds (birds also like to feed on its berries). Not only does its natural look work in any home landscape, but it also requires very little attention once established. Interestingly, extracts of the leaves and stem have been used for treatment of many skin diseases and other ailments. Recent research also shows it has antibacterial and antifungal properties from the phytochemicals found in the leaves. The firebush’s mature size will depend on where it’s placed. Left untended, it can reach heights of fifteen feet, but you can keep it in check with routine pruning. Its organic form makes it a great selection for a casual hedge or privacy screen. Especially salt and drought-tolerant and disease-resistant, this perpetual bloomer prefers the warmth of southern Florida with full sun and well-drained soil to make its most colorful impact (It can tolerate partial shade but blooms will be less frequent.). Plant your firebush in front of a tall fence; along a walkway; around your patio or as a stand-alone plant. Regardless of your choice, you’ll be treated to a beautiful display of dazzling, vivid flowers. We invite you to find the perfect spot in your Florida landscape for this indestructible plant. 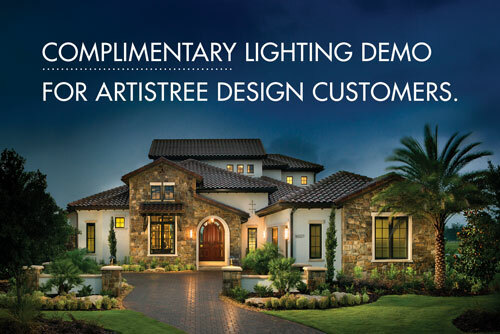 Or, call ArtisTree’s design studio at 941.488.8897 to schedule a free consultation on your landscape renovation needs. I am thrilled with how great our yard looks. The guys who worked on it are the best. Chris was never too busy to answer my thousand questions, and to me it seemed I was the only job they were doing. I appreciate their attention to detail. Thank you so much for working with us. ARTISTREE SALUTES THE RED, WHITE AND BLUE.